Win: Wentworth Season 4 - The war behind bars | SWITCH. 'Wentworth' Season 4 sees Bea battle two formidable enemies. There is Kaz, made so dangerous by her extremist feminist ideology, who regards Bea as the great betrayer to the cause, and Ferguson is on a mission to exonerate herself for the death of Jess – the walls of Wentworth will not be enough to protect the Top Dog. Franky is focused on making it on the outside and while home life with Bridget isn’t perfect, they are navigating the terrain together. Vera has finally achieved what she wanted, the Governorship and while she thinks she is the upper hand with Ferguson, her control is short-lived. Will is promoted to Deputy Governor and has a target on his back, a residual of past actions. Liz, Doreen, Maxine and Boomer return in the latest series loyal to Bea but the bond is tested as Kaz sets out to undermine the status quo of Wentworth and weaknesses are exposed. The 'Wentworth Season 4' competition has now closed. Winners will be announced shortly. Competition opens at 5pm AEDT on Sunday 2nd October 2016 and closes at 11:59pm AEDT on Sunday 9th October 2016. Ten winners will be chosen at random on Monday 10th October 2016. To successfully win, entrants must fulfil the above entry conditions before the time the competition closes. Current members/followers are eligible to enter the competition. Only one entry per person. Only one winner per household. To be a valid winner, the entrant must not have won a prize from SWITCH within the last 28 days. Each winner will receive one Blu-ray copy of 'Wentworth Season 4'. By entering, you agree to receive occasional emails from SWITCH in the future. If you decide to unsubscribe from these updates, any further entries will not be applicable. Only Australian residents are eligible to enter. 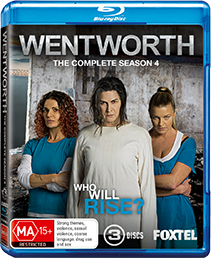 'Wentworth Season 4' is available on Blu-ray and DVD on Wednesday the 5th October 2016 from Roadshow.